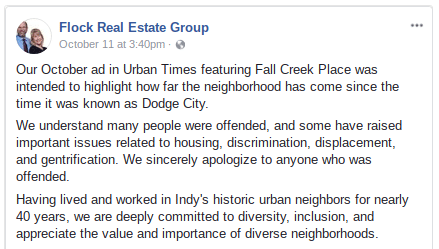 Indianapolis-based brokerage Flock Real Estate Group has received a warning from the Fair Housing Center of Central Indiana for an October ad that used what some call “coded language” to describe the African-American residents who once lived in the Fall Creek Place neighborhood. According to a WTHR 13 report, Fall Creek Place was once known as Dodge City because residents often had to “dodge” the prevalent gang violence. Years have passed and the area is now filled with $600,000 homes surrounded by lush scenery — something real estate agent Kurt Flock wanted to highlight as a selling point for four listings he had in the neighborhood. It was once an unseemly place filled with unholy habitats and vice lords. Thusly people banded with bureaucrats and rebranding Oracles who ordained Dodge City be henceforth and forever known as Fall Creek Place. With blessing of the banks, brokers and bureaucrats ZMC Urban Homes began building new homes for the blessed who believed urban living could be holy, hip, righteous and upscale. People flocked Downtown, and ZMC build mightily, and a new order of peace and prosperity spread across from Goose the Market, where kingdoms start at $636,000. Only four left. Yikes. 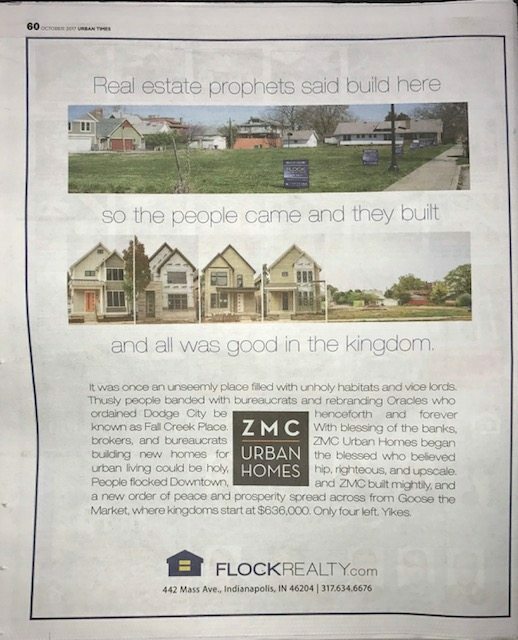 Residents took offense to Flock’s ad, saying he used coded language to negatively describe the once predominately African-American neighborhood. “… The white savior complex that they have — that they’ve come into this downtrodden neighborhood that was just full of these drug dealers and unsavory people. And now they’ve gotten rid of them and now everyone that’s good can come in and move into this neighborhood,” said resident Satchuel Cole of the ad. Cole said she’s especially upset with Flock since he’s apparently made a habit of using coded language to describe the former residents of the areas where he now does business. “Come on, we all know what you’re saying,” Cole finished. 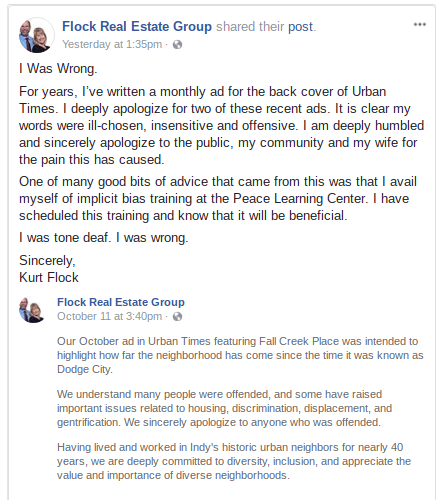 Yesterday, Flock posted another apology to the Flock Real Estate Group Facebook page where he promised to go through implicit bias training. The Fair Housing Center of Central Indiana was tipped off to Flock’s ads and issued a short, yet stern warning: “Describe the property, not the people or the people that may be there or were once there or that may come there,” said Fair Housing Executive Director Amy Nelson.